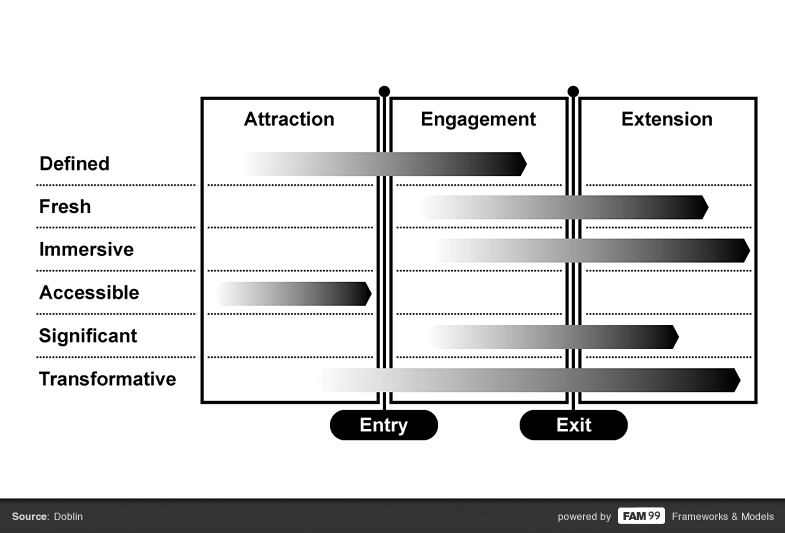 The “Engagement Framework” is used to describe different stages of customer engagement with a service over time. When we engage with a service thus experience can basically described as actions that happening in moments. We have to analyze those moments to fully understand the experience. The “Engagement Framework” is separated into three stages. Attraction (the process of making us aware), Engagement (the process of doing it), Extension (the process of leaving or continue). Each process can by analyzed through 6 attributes. Do the pieces hang together? Does it startle, amaze, amuse? Can you loose yourself in it? Get it to do what you want? Does it make you connect, think, grow? Do you have something to show for it? Might other think you have changed? Do you want to tell someone about it?